Redeeming Life Ministries International resides under the ministerial covering of the International Communion of Evangelical Churches (ICEC), under the honorable Bishop Eugene Reeves; ICEC 2nd Presiding Bishop and Presiding Prelate, Eagle’s Rock Diocese. The Eagles Rock Diocese is a global network of churches and ministries that share a common faith and discipline in historic Episcopal government. Since its inception in 2002, the Eagles Rock (formerly called the Province of St. John) was established to be a force multiplier in the advancing of God’s Kingdom. Committed to tenets of the Christian faith as established in the Word of God, the Eagles Rock upholds the biblical standard of truth and righteousness and serves as a beacon of light and prophetic voice to the nations. This dynamic and expansive Christian network extends nationally and internationally with established and flourishing covenantal churches throughout the United States, South America, Africa and Europe. Rather than being organized geographically, the churches and ministries that comprise the Eagles Rock are connected on the basis of covenant relationship and apostolic covering. 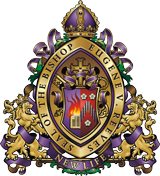 Under the apostolic leadership of Bishop Eugene Reeves, the Eagles Rock Diocese continues to advance and extend the Kingdom of God around the globe through evangelism, missions, church planting and pastoral leadership development. The Eagles Rock Diocese hosts an annual summit which is a gathering of pastors, church leaders and church laity from around the world with the primary focus of empowering and equipping the Body of Christ to fulfill the Cultural Mandate as expressed in Genesis 1:28 and the Great Commission as expressed in Matthew 28:19-20. The Eagles Rock is successfully fulfilling this great call by impacting the world through cultural engagement that lifts up the King of kings, Jesus Christ, the Lord. The EAGLES ROCK is the place where eagles gather to be strengthened and refreshed in their journey and that ROCK is JESUS CHRIST!